In-depth information and ring size conversion chart. Read on if you want to know more about how we determine ring size. This article includes detailed guidance on how to find out your finger size. In addition to expert guidance, we offer a free UK ring sizer. We also send our actual size samples Worldwide for clients to double-check their ring size. Depending on where you live in the World, you could be working to a variation on another country’s size system. Some systems use a number (US) or letter (UK) — we can work to either system, without needing to convert. Please just advise us whether you wish to order in the UK or US size. 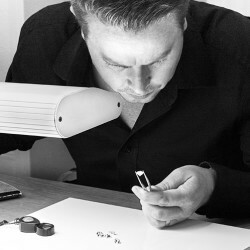 We can create almost every engagement ring and wedding ring design in most finger sizes. This includes finger sizes considered to be oversize and undersize—outside the norm for many jewellers. Please note that if you do not see your finger size on our product pages, message or email us with your design and we’ll come straight back to you. 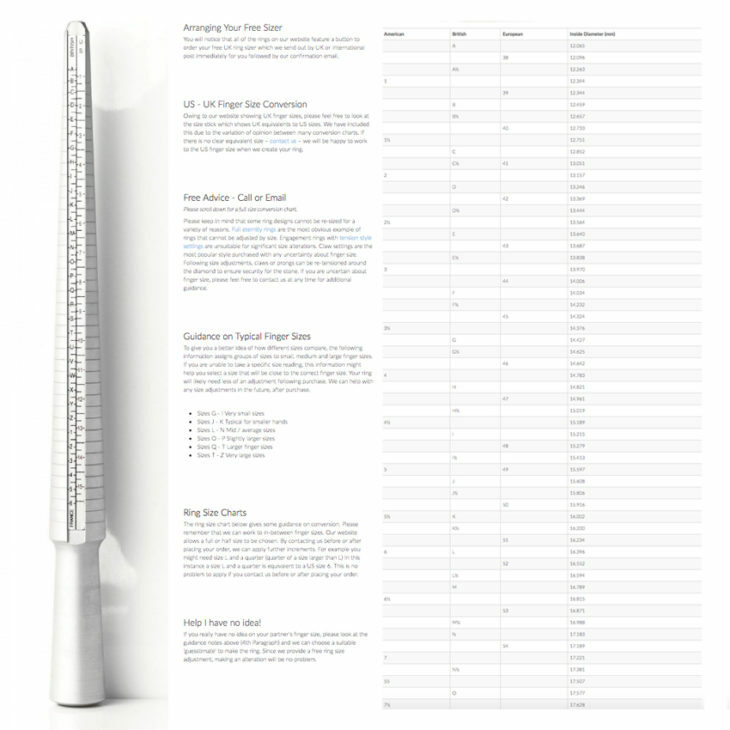 If you would like a free ring sizer please visit any of our engagement ring or wedding ring pages and follow the link. We send out your free finger sizer from the UK straight away by First Class Mail. International – Non-UK size systems? Within the UK, letters are used, to denote finger size. The nearer the letter to the start of the alphabet, the smaller the finger size. 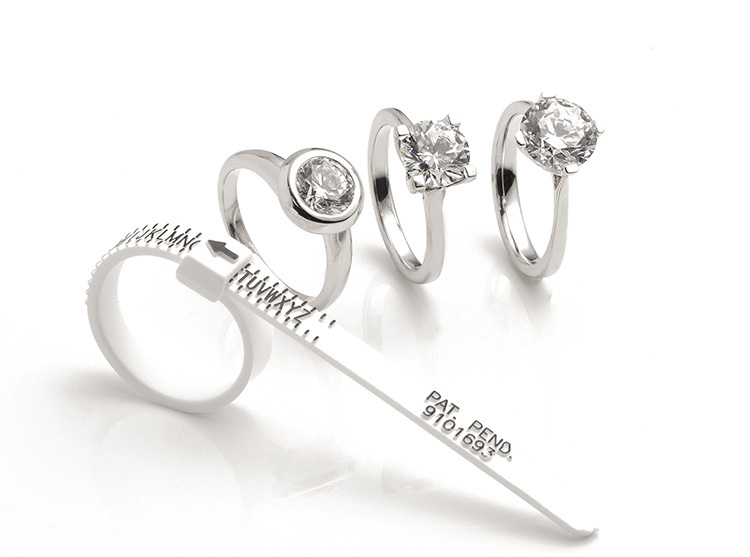 Most jewellers measure size with a set of dummy rings which can be tried to find the correct size. Identifying size from an existing ring requires the size stick which carries markings to denote size. Our size sticks carry UK, and International markings allowing easy accurate conversions to be made. Ring size in a nutshell. As a rule of thumb, the following sizes give you an idea of where some of the small, medium and larger UK finger sizes lie. What is a small finger size for rings? Small finger sizes are finger size that are size F or G through to size J. What is a medium finger size? A larger proportion of people have a finger size between size K and size O. 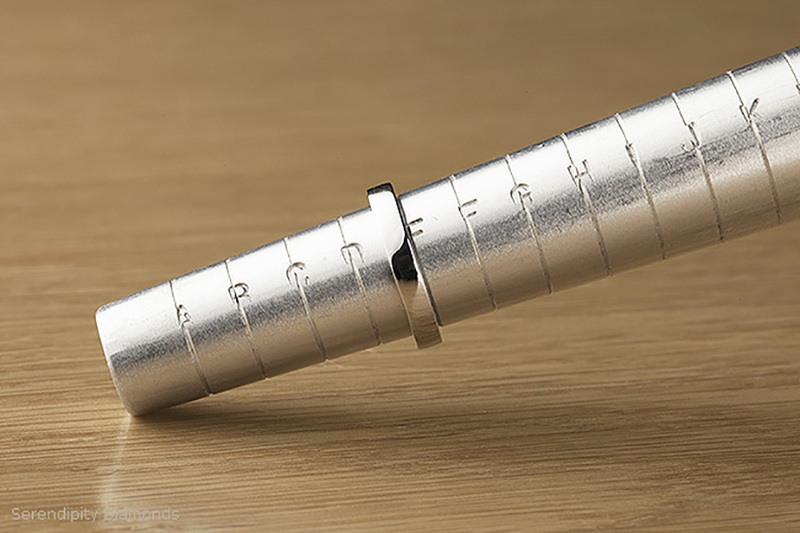 Within the UK, L is one of the most popular finger sizes. Sizes within this range tend to be considered average finger sizes. What is a large finger size? Larger finger sizes tend to range from sizes P and Q upwards. Engagement rings and wedding rings are made in larger finger sizes, but sizes S and T upwards are most popular for men’s wedding rings. Above size Z, sizes typically increase with +1, +2, +3 indicating incremental full sizes above Z. Keep in mind that engagement rings in larger sizes will sometimes be considered a bespoke ring design, made to order specially. The following factors influence finger size and should be considered before you make your purchase. 1. Temperature – Depending on whether you are warm or cold, finger size can vary slightly. Colder weather normally results in rings feeling slightly looser. 2. Tissue fluid – Water levels within the tissues of the human body can affect the size of your finger. This can include particular times of the month falling in line with the female Menstrual Cycle. Pregnancy is also a factor. 3. Ring width – Wider bands tend to feel closer to the finger than narrower bands. This is because the ring is in contact with a greater surface area of the finger. 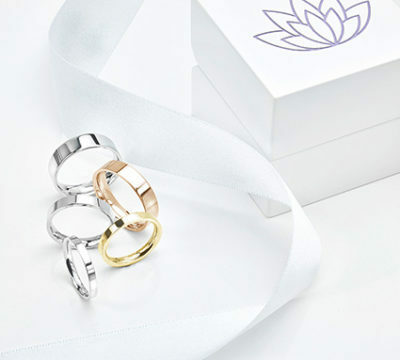 If you are purchasing a wider band (engagement or wedding ring) you are wise to try on any ring of similar width or use a set of wider band ring sizers. 4. Knuckle size – Although knuckle size has little to do with finger size, the ring still needs to slide over the knuckle when placed on the finger, and when removed. If you have larger knuckles, there are suggestions for working around problems. Arthritis can be a significant problem which we allow for. Contact us for more advice on this particular subject. 6. Dominant hand – Please keep in mind that the dominant hand can be upto 2 finger sizes larger than the other hand. If you are basing her size on a ring fitted to the third finger of her dominant right hand, then you might want to consider at least one size smaller for a left (non-dominant) engagement ring finger. Although we send out a free ring sizer (see our product pages) we recommend obtaining your finger size during a visit to an experienced jeweller. Within a short space of time, you will judge how certain sizes feel. How should a wedding ring feel on the finger? If you’re seeing a ridge on your wedding ring finger, this is perfectly normal. Most wedding rings cause a smooth depression below the wedding ring. This forms a natural indent into which your wedding ring rests. If your wedding ring causes discomfort, irritation, redness or swelling we recommend removing the ring and re-assessing finger size. Do wider bands fit more snuggly on the finger? 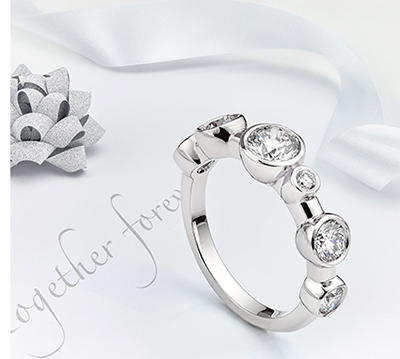 It is a fact that two rings of the same size, in different widths, vary in their fit. Wider bands with a flat inner surface hold more surface area. As a result a wider band will feel more snug on the finger than a narrower band of the same size. What happens if your ring is too small or too large? If your engagement ring or wedding ring is too large or too small, it will need to be resized. Some designs and size differences are easier to size than others. The first step is to contact us for expert guidance. If you purchased your ring elsewhere, we recommend contacting the original seller first. For simple, plan wedding rings most metals can be stretched or reduced slightly in size. Engagement rings with claw settings are easier to size than other styles such as tension style settings. How long does it take to re-size an engagement ring or wedding ring? It typically takes around one and a half weeks to resize a ring. Rings are cleaned and re-finished as part of the process. As a note, we quote in advance, before any work commences as part of our policy when it comes to changing a ring size.